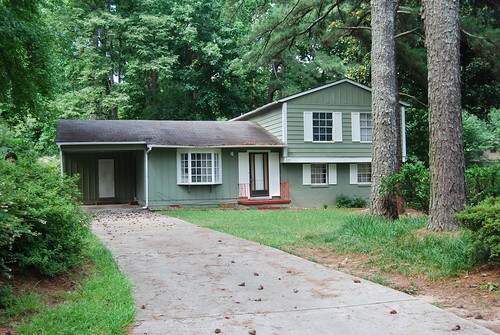 Here is a picture I took of the house two months before we bought it. It was taken in July, so the green stuff was at its peak. I wish I had a picture of it the day we closed!! The weeds were taller than Paul in places. This picture was taken a few months ago. We had taken off the shutters from around the front door because I thought they looked weird, only to discover that it was the house’s original color underneath (yellow). It remained like that for the next 18 months because after a while, you don’t even notice the flaws anymore. 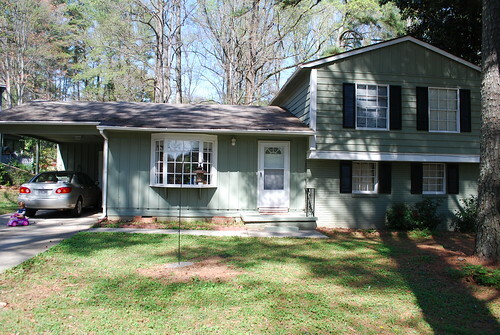 * Painted the shutters and the railing by the front door black. * Painted the entire front section of the main level of the house. I was just going to paint around the door, but the paint was so slightly off in color that it looked better to paint all the way across. It really brightens up the house! * Painted the front stoop to match the house. I noticed a few things about the house when I was up close, painting. For one, the color used to be yellow. 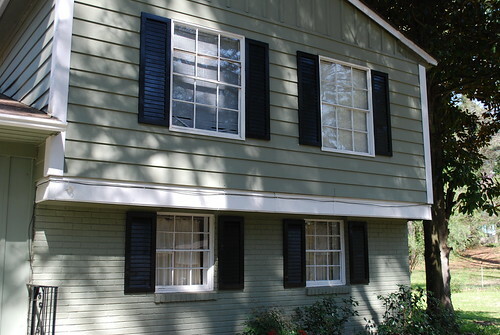 The shutters used to be teal green. I am pretty sure the brick section was the original brick color until the previous owners painted the house green in 2006. 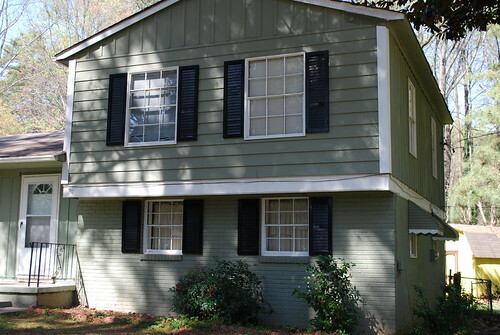 (I’m currently researching ways to get paint off brick – I’d love to return it to that original state, since I love, love the look of brick on a house.) I think at one point, brown was an accent color, since it is the color of one of the stoops in the carport and the stoop outside the sliding glass door in the back. I am also looking into getting a paint sprayer, because after looking at what needs to be done in the back and also the shed, I think a paint sprayer would be worth the money. That project will come later, though; maybe this summer? Depending on how the budget runs. And I meant to get a picture of the 14 bags of leaves, pine straw, and pinecones sitting by the curb, waiting to be picked up last Monday. I am happy to report that I did my 30 minutes a day, and it was wonderful to force myself outside and also so satisfying to see the leaves in the bags and not on the ground. Trust me, it looks soooo much better. 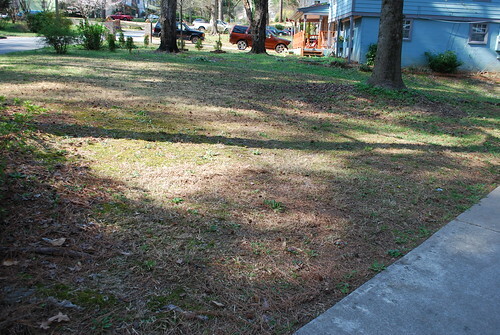 Paul got the lawn mower working and cut all the grass/weeds – they were getting pretty tall and made the yard look so ragged! Overall, the yard looks much better than it has, but overall not much different from when we bought the house – we didn’t really do much yardwork last summer. Next on the horizon is the backyard, which we are currently collecting quotes about that. This entry was posted in our house. Bookmark the permalink. P.S. I LOVE the black shutters. Great choice!! Thanks, Char!! I really was leaning towards black, but when I started asking for advice I had some people who felt strongly against black, so I was torn! :-) I am thrilled with the result. I think another color could have worked, but this is exactly the look I was going for. Oooh it doesn’t surprise me that you’d go with green, Joanna. :-) What shade did you pick out? OOOOOOOOOOOH that looks so great! The shutters are perfect and the railing and stoop look so good. I also think it was good for you just to paint the whole front section of the house. If you want to get a paint sprayer, is that something you can rent from Home Depot or something? I just think we would use it more than once. You see, thanks to the EPA laws about houses built before 1978, it is never going to be cost effective for us to hire someone to paint, so we will have to always do it ourselves. So I could see it being a worthy buy. I think you can get good ones in the lower $100 range, so it would probably pay for itself pretty quickly (if you compare to renting one). Of course, I haven’t *actually* priced anything so I might be wrong. By the way, I really want to put the other railing back up (on the left side of the stoop). The siding is damaged where it was screwed in before, so we’d have to move it slightly, and I’m not sure about how to attach it to the cement of the stoop. I’m a bit behind on reading blog posts but I just HAD to comment on how good it looks! Seriously! Also, I bet you could find a used sprayer on Craig’s List.